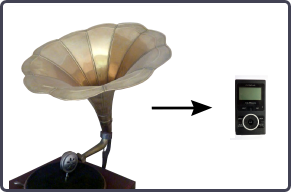 Despite many differences, all wireless audio systems share some common components: an audio source, a transmitter, a receiver, and an audio reproduction device. The audio source is the device that contains the audio signal. 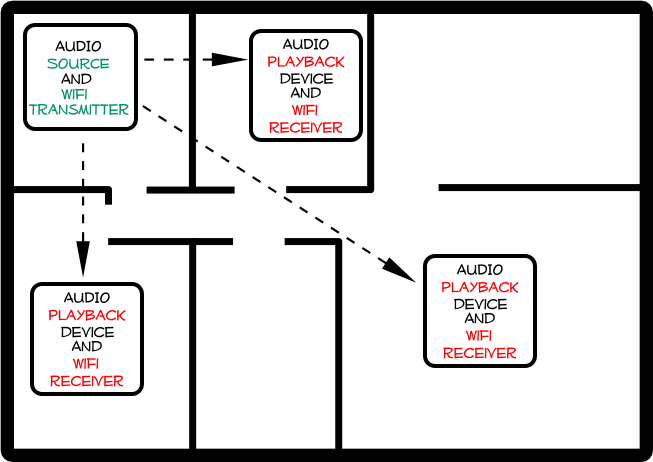 The transmitter receives the audio signal from the source and then transmits the signal wirelessly. The receiver picks up this wireless signal and passes it to the audio reproduction device which plays the signal back as audible sound. FM transmitters are often used to transmit audio from source devices like MP3 players, satellite radio receivers, etc. to car stereos, home theaters, or portable radios. Many times they can be found in gyms or fitness centers where they are used to transmit audio from televisions. People who are exercising simply tune their radios to the FM frequency listed below each T.V. to hear the audio. If you're not familiar with the term "WiFi", please click the link above to learn more. 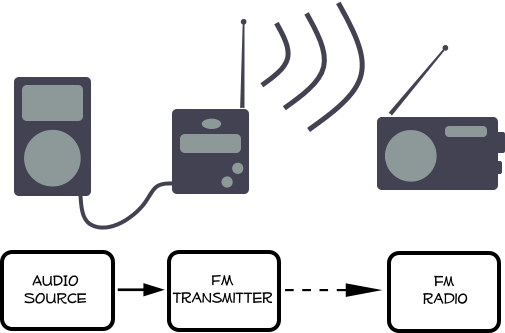 In regards to audio, WiFi offers the same provisions as Bluetooth, but the operational range is usually about 250 feet with clear line of sight. Compared to the mobile benefits of Bluetooth, WiFi is typically more of a home-based technology that is able to connect multiple devices together to form a network. This networking ability works out great for setting up wireless audio systems to serve entire buildings.